The Olympic Village is traditionally a place where world class athletes come together and share a common admiration for each other and their exploits. As athletes arrived in the United Kingdom for the fast-approaching start to the 2012 Games, it turns out that both the Australian swimming team and the Team USA basketball squad are sharing the same Manchester hotel. A show of mutual fandom was shown when NBA star Kobe Bryant (Los Angeles Lakers) visited the pool where the Aussies were swimming. The swimmers took turns greeting Kobe and sharing the love. 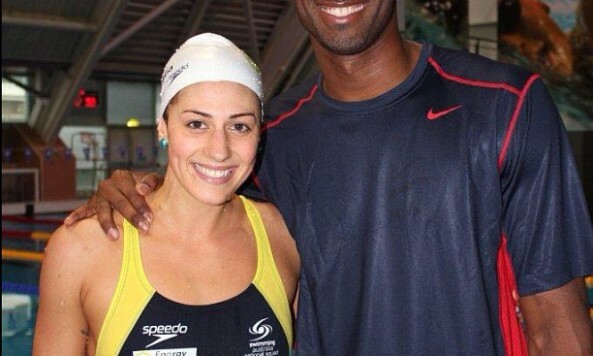 Of course, Aussie swim hearththrob Stephanie Rice took centre stage when she presented the Black Mamba with a Team AUS swimming costume — which Kobe apparently questioned the size of (watch video here, courtesy of Australia’s Nine News). Rice took to her instagram account to post the photo above with Bryant. 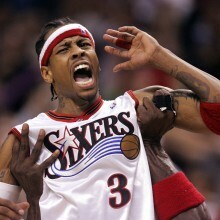 I just love the big wet handprint on Kobe’s chest, not to mention the goofy grins of shared Olympic joy.